Series Overview: Connections: A Lectionary Commentary for Preaching and Worship provides new resources to help preachers achieve the goal of connecting congregations to Scripture. This nine-volume series offers creative commentary on each reading in the three-year cycle of the Revised Common Lectionary. It does so first by viewing that reading through the lens of its connections to the rest of Scripture; and then seeing the reading through the lenses of culture, film, fiction, ethics, science, and other aspects of contemporary life. Included as well are commentaries on the Psalm readings that connect them both to the other readings for the day and to the congregation's experience of worship. As the newest lectionary commentary, Connections is perfect for those who use and love Feasting on the Word. 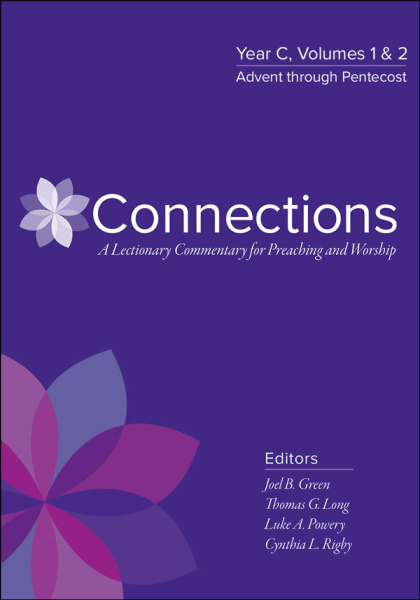 Connections is published in partnership with Austin Presbyterian Theological Seminary. Rev. Dr. Luke A. Powery is Dean of Duke University Chapel and Associate Professor of Homiletics at Duke Divinity School. He is the author of Spirit Speech: Lament and Celebration in Preaching, Dem Dry Bones: Preaching, Death, and Hope, and many other books. He is ordained clergy in the Progressive National Baptist Convention. Rev. Dr. Cynthia L. Rigby is the W. C. Brown Professor of Theology at Austin Presbyterian Theological Seminary in Austin, Texas. Rigby is the author of more than thirty articles and book chapters. She is ordained clergy in the Presbyterian Church (U.S.A.). Rev. Dr. Joel B. Green is Provost, Dean of the School of Theology, and Professor of New Testament Interpretation at Fuller Theological Seminary. He has written and edited numerous books, including The Dictionary of Jesus and the Gospels, The Dictionary of Scripture and Ethics. He is ordained clergy in The United Methodist Church. Rev. Dr. Thomas G. Long is the Bandy Professor of Preaching Emeritus at Candler Theological School, Emory University. He is a world-renowned preacher and was named by Time magazine as one of the most effective preachers in the English language. He has authored more than twenty books. He is ordained clergy in the Presbyterian Church (U.S.A.). Rev. Dr. Carolyn J. Sharp is Professor of Homiletics at Yale Divinity School. She has written and edited numerous books, including Irony and Meaning in the Hebrew Bible. She is an Episcopal priest.